If giving your business the best possible means of working is your main concern, then installing a high quality and reliable material handling supply chain throughout the production and distribution process should be one of your main priorities. In a business that runs at an optimum level, you will be able to find greater cost savings than otherwise, and this will enable you to become more and more competitive and improve profits. Thanks to the range of equipment available at Easy Rack, you will find the means to improve the material handling supplies throughout your business, and use the latest technology to make it easier to get raw materials to your production staff whenever they need it. The core aspect of providing an efficient material handling supplies chain within your facility is proper stock. Having plenty of storage space means extensive shelving that can be easily accessed using a forklift truck. Easy Rack are specialists in the supply of high quality versatile shelving and rack units for your business, and provide every possible item of storage space from wall mounted cantilever racks to support metal pipes and strips of plastic through to high quality fork lift storage shelves, you will find everything that you are looking for in our extensive online store. The biggest step in the material handling supply chain in any factory or industrial facility is the stage from the warehouse to the workbench. In most cases, a forklift will be required, particularly under circumstances where large and bulky items are required. Generally, standard forks are well suited to palletized loads, however, for more specialist items such as drums or loose items, hoppers and special fork lift extensions are incredibly useful, and will allow for safe handling of whatever item you need to carry. Forklifts play a vital role within the material handling supplies chain within the factory, and their role should be maximized due to the relatively high cost of acquisition that they represent. There are plenty of accessories available that can modify the truck for special purposes, and this extends the range of their usefulness significantly. Most adaptations such as a self tipping hopper or oil drum carrier are fitted as forklift extensions, so the systems are very easy to add. Other areas of material handling supply that are important to consider are the final step in the journey of the raw product to the workbench. This final step can be either achieved by hand if the item is small enough to lift by a person, or alternatively, may have to rely on the use of some kind of lifting system. There are a number of different options available to you, and all have very specific advantages. One of the most popular and flexible options is the jib crane. These can be either fixed or mobile, can utilize either an electronic lift or a manual system, and are excellent for lifting heavy weights from the ground and then be swung into place. 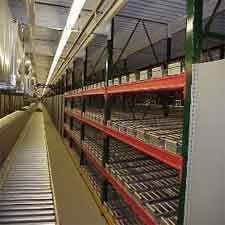 Of course, the internal material handling supply system that you build into your working processes will also include many other pieces of equipment such as carts and trolleys, pallet jacks, and gantry systems, but the core of the system should always be kept as simple as possible in order to ensure maximum efficiency. The multi-function shipping cart we ordered from Easy Rack h ..